On March 23, S.W. Hackett Lodge No. 574 sponsored its 10th annual spelling bee at Sequoia Elementary School in San Diego. Fourth, fifth, and sixth grade students participated in the competition, which was overseen by Sequoia Elementary Principal Ryan Kissel. Sequoia teachers presented words to be spelled, and a full house of family and friends cheered on the children. At the end of the competition, lodge members awarded cash prizes to the first, second, and third place finishers in each class; first place winners also received trophies. The spelling bee is part of S.W. 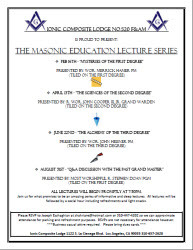 Hackett Lodge’s “Partnership in Education” project, which is supported by the efforts of Past Master Jim Achenbach. Later in the year, the lodge also plans to recognize a Sequoia Teacher of the Year at one of its stated dinners. Photo: Members of S.W. Hackett Lodge No. 574 pose with Sequoia Elementary Principal Ryan Kissel and winners of the 2012 Sequoia Elementary School spelling bee.